In 1940, the United Kingdom went to war with the Axis in North Africa and quickly encountered an unnerving tactical problem. The nature of warfare in the flat, open desert inevitably favored tanks, which could easily outrun the range of supporting artillery that could not move unless towed. Limbering and unlimbering artillery was time consuming, so the British Army hastened development of a 25-pounder self-propelled howitzer called the Bishop. Weapons rushed into combat often make for poor weapons — and the Birmingham Railway Carriage and Wagon Company’s self-propelled Bishop howitzer was exceedingly poor indeed. Foremost was the technical problem of affixing a howitzer onto a chassis. 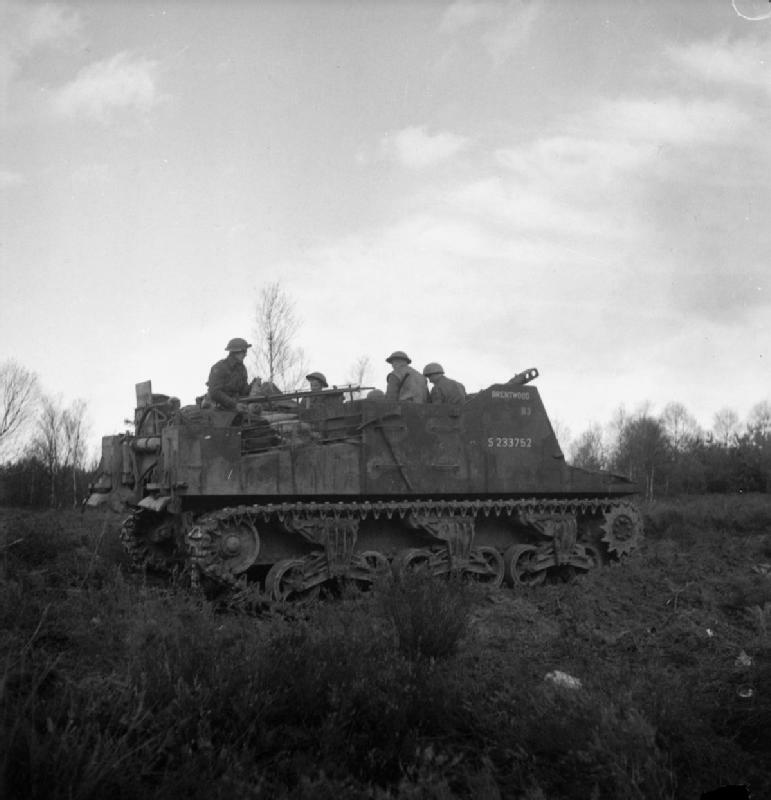 The company took a Valentine tank, a rugged workhorse of the British armored forces, and swapped the turret for an enormous, boxy superstructure which increase the vehicle’s height to 10 feet. That became the inspiration for its name, and gave the Bishop a tall profile. A high profile for a howitzer was not a serious problem, in theory, as artillery is supposed to stay far away from the lines. But the Bishop couldn’t stay very far back given the howitzer’s limited vertical elevation which tapped out its firing range to 5,900 meters — well within the range of the fearsome German 88-millimeter gun and half the 25-pounder cannon’s normal maximum range. In the open desert, the Germans could see the Bishop coming, and with the right weapons, destroy it before it could get close enough to fire its own cannon. As a result, British crews often parked the Bishop on ramps to add as much extra elevation as possible. 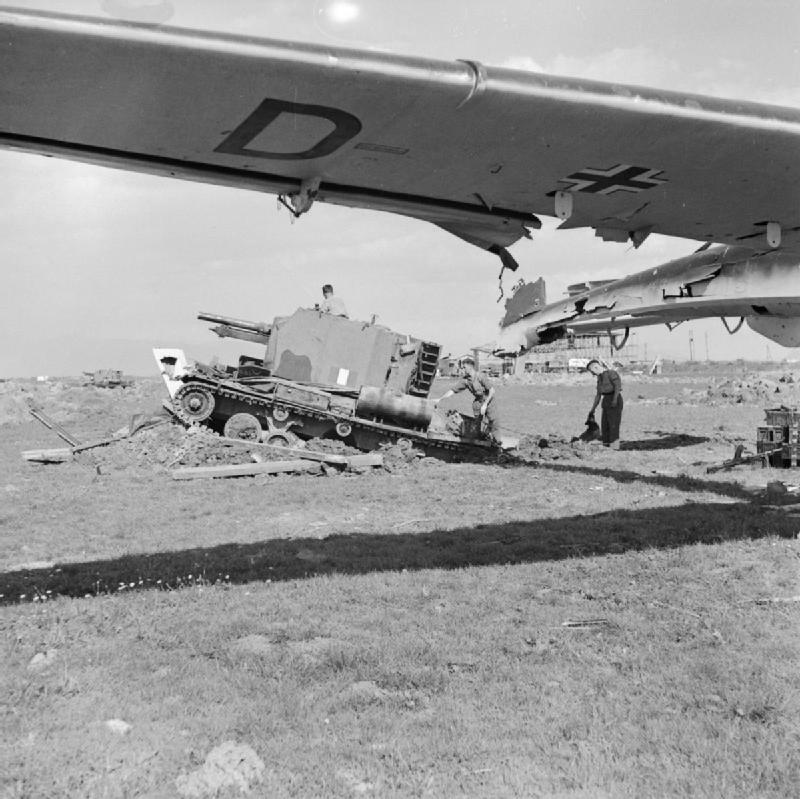 Nevertheless, ramp or no, the combination of relatively short range — for a howitzer — and the Bishop’s enormous size was a problem particularly in combination, because the Bishop was intended to also serve as an anti-tank weapon, as British tanks lacked the firepower to stand up to German Panzer III and IV tanks arriving to North Africa. The Bishop superstructure’s interior was also cramped, making for an uncomfortable experience for the crew, and only 149 were produced in total between 1942 and 1943. While the gun did see combat, including during the enormous Second Battle of El Alamein in November 1942, which helped break the Axis Powers’ back in North Africa, the British quickly moved on to better self-propelled guns including the U.S.-made 105-millimeter M7, dubbed “Priest” by the British, although that required a steady supply of American ammunition instead of the British industry’s 25-pounder shells. However, it was the Bishop’s failure that helped spawn later successes, as the Bishop was part of a family of ecclesiastically-named howitzers. 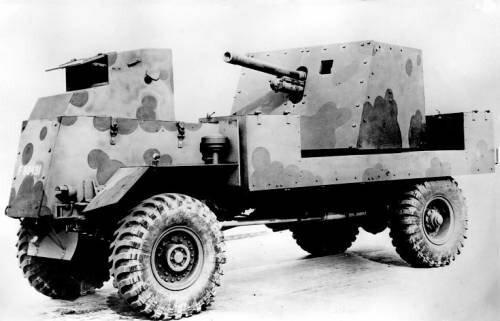 The AEC Mk I Gun Carrier “Deacon” followed the Bishop and was a decidedly lower-tech self-propelled gun than its heavier counterpart — with a significantly smaller armament of a single six-pound gun mounted on the back of a wheeled AEC Matador 4×4 truck. The Deacon was lightly armored compared to the Bishop — some 20 millimeters of armor compared to 60 millimeters in the Bishop’s chassis. But one advantage possessed by the Deacon was its ability for the crew to cover the gun and disguise it as a regular truck. The Deacon’s firing range of around 5,000 meters, and penetrating power, made it a capable tank-killer without the Bishop’s high profile. The Deacon’s maximum speed of 19 miles per hour was also slightly faster than the Bishop, which topped out at 15 miles per hour. Of Britain’s ecclesiastically-inspired howitzers, the Sexton — a church officer who watches over the graveyard — was perhaps the most appropriate. It was the most satisfactory of Britain’s war-time mobile howitzers, and was the most widely produced with more than 2,000 built between 1943 and 1945. It continued to serve for 11 more years after the war. The Sexton solved two problems. First, it corrected the Bishop’s deficiencies including the gun, which had only a +15 degree elevation. The Sexton’s gun could reach up to +40, and the vehicle’s maximum speed was a brisker 25 miles per hour, comparable to a Sherman tank. Second, the Sexton carried one of Britain’s familiar 25-pounder guns, which was easier to supply than the U.S.-provided M7 Priests. That the Sexton could keep up with Shermans came from the fact that the self-propelled gun was practically a Sherman. 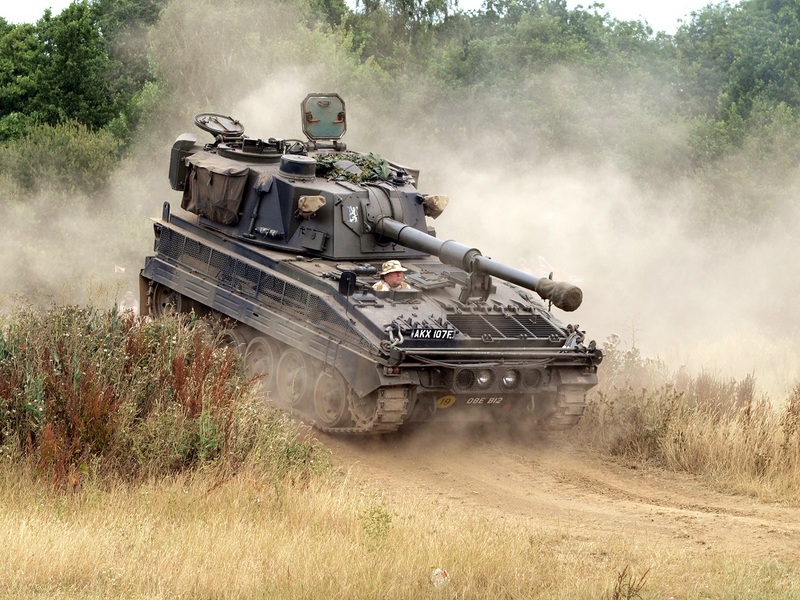 The British Army contracted the design to the Canadian Army, which developed the howitzer on the Ram and later Grizzly chassis — Canadian versions of the M3 and M4A1 Shermans, respectively. The Sexton went on to see extensive combat use during World War II with both British and Canadian forces in Europe. The last of the church-themed British mobile guns, the FV433 Abbot SPG, became Britain’s contribution to self-propelled artillery during the Cold War soon after it entered production in the 1960s. It was not the only weapon of its type in the British Army, however, as it shared service with U.S.-made self-propelled M109 howitzers. The Abbot was, of course, a generation beyond the Sexton with its fire-control computer, traversable turret, 105-millimeter howitzer capable of elevating upward to +70 degrees, and a significantly farther firing range of 10 miles. The British Army would ultimately retire the Abbot in the 1990s with the introduction of the AS-90, although India — the only other user — still fields around 80 Abbots, to be replaced with an Indian-manufactured variant of the South Korean K9 Thunder. India, however, has has struggled to acquire artillery since the Bofors scandal in the 1980s, which helped bring down a government, and the recent death of two South Korean soldiers in a K9 mishap has clouded the arms deal.